On October 25, 2018, Ollie Lou Richardson Jones, 93, passed away. She was preceded in death by her husband of 68 years, CPO Charles C. Jones, USN (Ret. ), parents Milton and Velma Richardson, sister Annie (Ann) Mae O'Kelley, and brother Herman Richardson. She is survived by her two sons, Charles of Oak Ridge, and Kevin of Richmond, KY; sister, Kathleen Richardson Smith of Dumas, MS, and brother, Bobby Gene Richardson of Ripley, MS, in addition to an extended family of nieces and nephews, grandnieces and grandnephews, and great -grandnieces and great-grandnephews. Since coming to Oak Ridge, TN over 50 years ago, she was a member of Trinity United Methodist Church. More recently, she faithfully attended the Alliance Church of Oak Ridge. 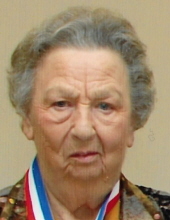 She was a longtime poll worker for the Anderson County Election Commission, and a member of the Ladies Auxiliary of the Fleet Reserve Association (Unit 194), and the Order of the Eastern Star. She represented Anderson County at the Regional Senior Summit in 2008. Also in 2008, she was the American Association for Retired Persons (AARP) Andrus Award winner as volunteer of the year for the state of Tennessee. The family will receive friends on Tuesday, October 30, 2018 from 11:30am to 1:30pm at Weatherford Mortuary, and the funeral service will begin at 1:30pm. The graveside service will immediately follow at the Oak Ridge Memorial Park. The Rev. Dale Crank will officiate. Online condolences may be made at www.weatherfordmortuary.com. To send flowers or a remembrance gift to the family of Ollie Lou Jones, please visit our Tribute Store. Burial to follow at Oak Ridge Memorial Park immediately after the funeral service. Meet at the cemetery in the Garden of Memories. "Email Address" would like to share the life celebration of Ollie Lou Jones. Click on the "link" to go to share a favorite memory or leave a condolence message for the family.